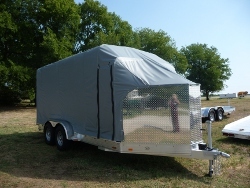 We would like to introduce you to one of our popular items – a Removable Canvas Enclosure to go on your Tommy’s Trailer, to cover those delicate cars that need to be hauled across country. 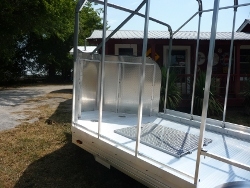 The enclosure on this unit is made of 18 oz. 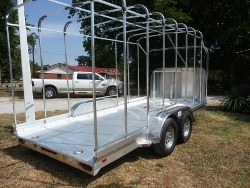 reinforced nylon canvas; has one zipper rear door that ties up to haul those long cars; one side zipper walk-in door, two front access doors to tie your cars down; a fully removable tarp and an ALL ALUMINUM FRAMEWORK WHICH CAN EASILY BE TAKEN OFF and set up on the ground for a one-car garage. The Topper has an inside height of six feet, is complemented by a Jet Stream Air Dam, and has a V’d nose. Many colors of the canvas are available at no extra charge.